One of the major limitations of underground cables is the fault detection. Since the cables are laid under the surface (directly or inside pressurized ducts), the visual methods of inspection don’t work effectively. This is not the case in Overhead Lines. In order to identify the faults in the cable, we need to develop special methods, which will be discussed in this article. Most of the faults occur when moisture enters the insulation. The paper insulation provided inside the cable is hygroscopic in nature. Other causes include mechanical injury during transportation, laying process or due to various stresses encountered by the cable during its working life. The lead sheath is also damaged frequently, usually due to the actions of atmospheric agents, soil and water or sometimes due to the mechanical damage and crystallization of lead through vibration. We shall study various faults and how to detect them. As the name suggests, this fault involves an open circuit in the conductors. When one or more cable conductors (cores) break, it leads to discontinuity. This discontinuity also occurs when the cable comes out of its joint due to mechanical stress. This is known as Open circuit fault. An open circuit is characterized by infinite resistance. This is utilized in fault detection. The conductors at the far end are bunched together (shorted) and earthed. Then the resistance between each conductor and the earth is measured using a megger. If there’s no fault, megger will read nearly zero. If there’s an open circuit in a conductor, the will read infinite when connected between that conductor and the earth. It occurs only in multi-cored cables. When two or more conductors of the same cable come in contact with each other, then this is called a short circuit fault. It is impossible to detect visually without taking the cable apart. A short-circuit fault occurs when the individual insulation of the cables is damaged. It can also be detected using a megger. A short-circuit is characterized by zero resistance. This is utilized in fault detection. 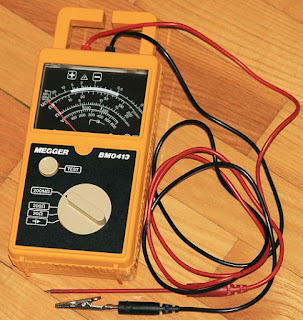 The resistance between any two conductors is measured using a megger. This is done for all the conductors, two at a time. If the megger reads zero, it indicates that a short-circuit fault has occurred between those two conductors. When any of the conductors of the cable comes in contact with the earth, it is called an earth fault. This usually occurs when the outer sheath is damaged due to chemical reactions with soil or due to vibrations and mechanical crystallization. It is somewhat similar to a short circuit fault as the current again takes the least resistive path and flows through the earth. This too can be detected using a megger. The megger is connected between the conductor and the ground and megger reading is noted. This is repeated for all the conductors of the cable. If an earth fault is present, the megger will show nearly zero reading. Hence we can detect faults in underground cables using a megger.